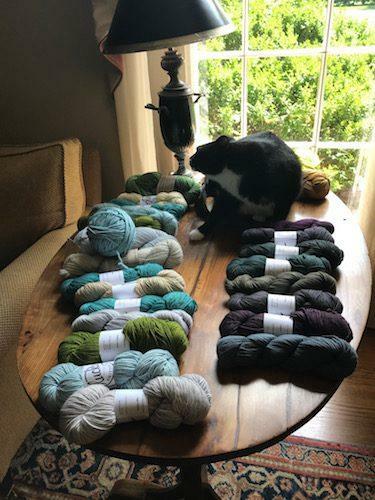 Inspiration / Team Blanket: Come Join In! Team Blanket: Come Join In! Knitters are amazing. 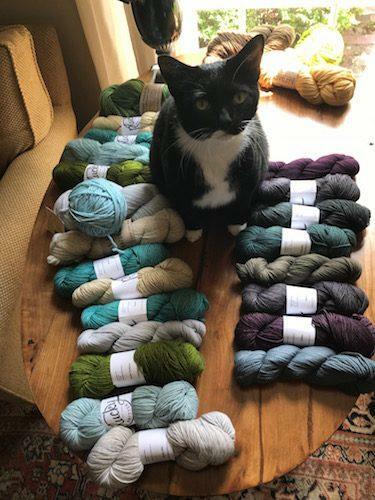 I think we all know this, but it never ceases to amaze me when knitters step up to help. It’s just so great. 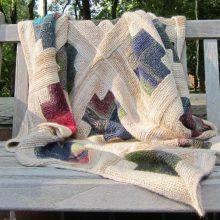 This idea of knitting a square for somebody who could use a blanket is very powerful. We have seen this power at work over many years, with blankets knitted for all sorts of people and reasons. 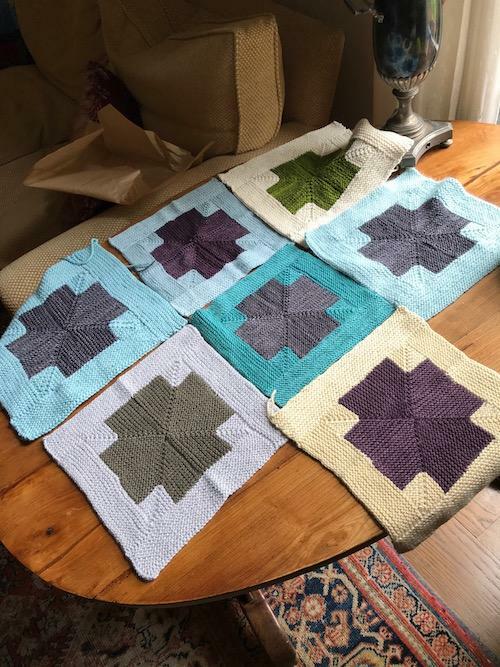 Last week, we wrote a post, “Team Blanket: How We Can Knit Blankets Together.” It was a call for knitters willing to lead the effort to coordinate groups of knitters online who want to knit a square for someone in need. Team Blanket! We instantly had volunteers willing to be the leaders of group-blanket-making teams, each with her own idea of a recipient who could use a blanket. To aid in communication, we’ve set up topics in the MDK Lounge where these leaders are getting groups together online who will knit for a particular recipient. And we’ve already seen a bunch of folks volunteer to knit squares. 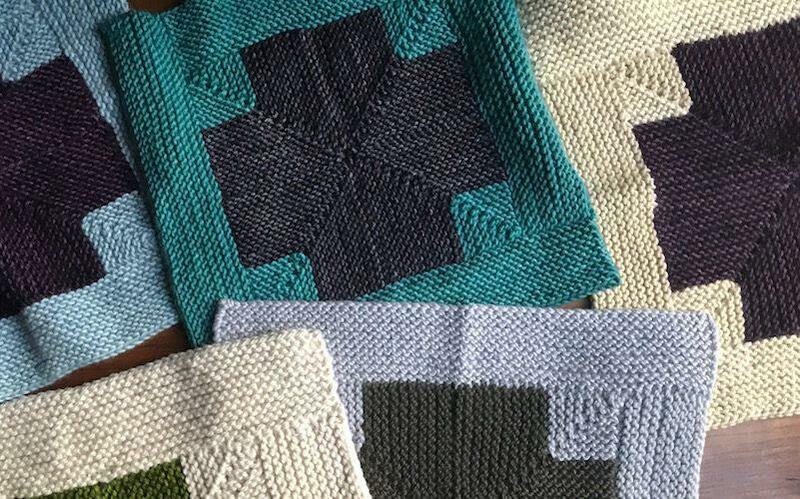 If you’re game to knit a square, here are the blankets currently under way. 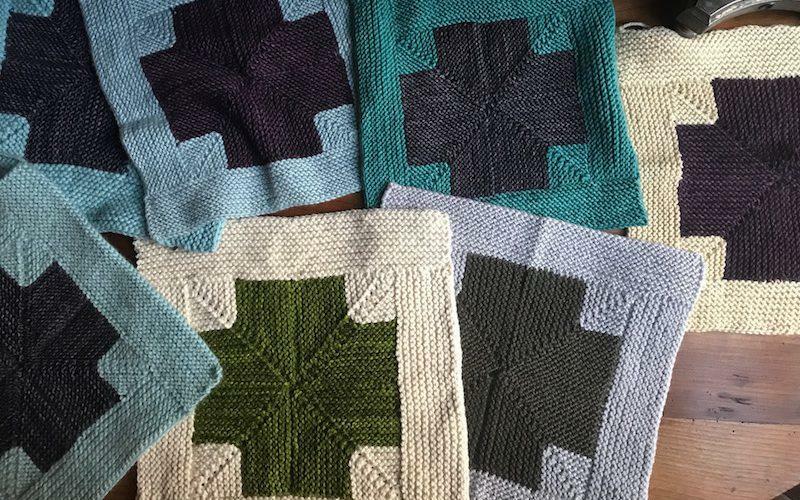 To volunteer to knit a square, click on the link below and leave a message in the thread for the blanket you want to knit for. Let’s get these blankets filled up with knitters! Team Blanket No. 1: For Carrie Swanson. Team Leader: Sarah Inskeep. Team Blanket No. 2: For Survivors of a House Fire. Team Leader: Karen Tumelty. Team Blanket No. 3: For a New Immigrant to the US. Team Leader: Sarah Gluck. Team Blanket No. 4: For a Grieving Mom. Team Leader: Jennifer Logan. Awaiting details from Jennifer, but feel free to volunteer. Our blanket for Tia Coleman is already starting to come together. 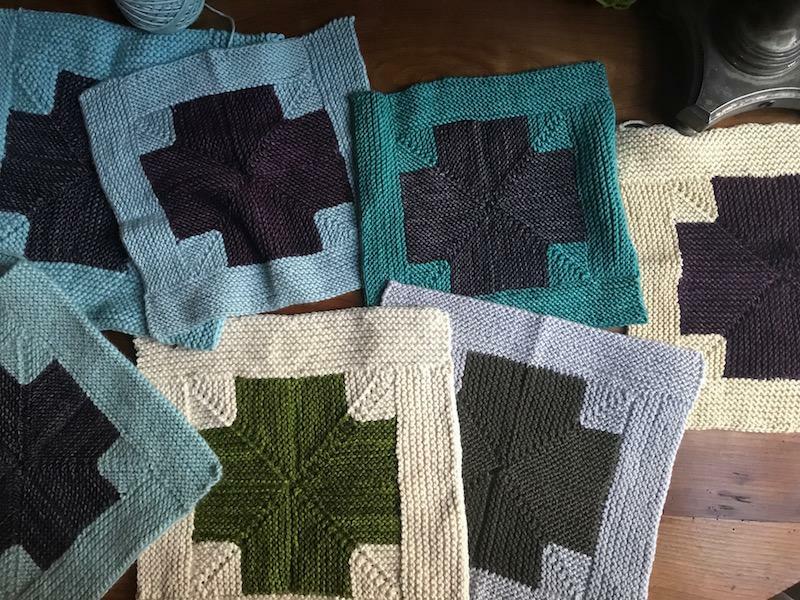 There are at least five different brands of yarn in these squares, yet I think it’s looking exactly like a blanket. 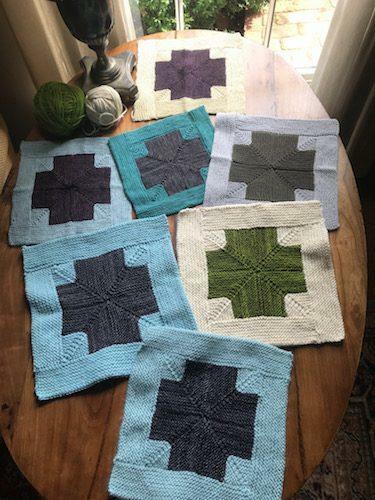 The squares are a variety of sizes, all in the neighborhood of 11 inches, and they’ll squish and stretch their way into blankethood when the time comes. 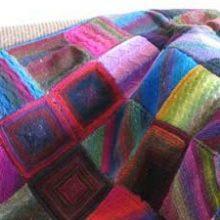 Blankets just do that when there’s this much intention and love built in to each stitch. 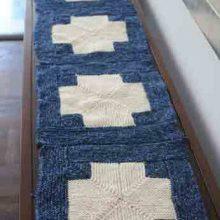 The pattern is our Mitered Crosses Blanket pattern. All proceeds to go Mercy Corps, a relief organization. 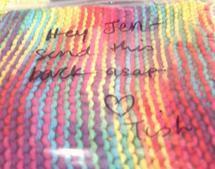 Thank you to Nell, Julibeth, Mary Anne, Jeanne, Kate, Ellen, Mary, Irene, Sue, Charlene, and Kay for making Tia’s blanket happen. 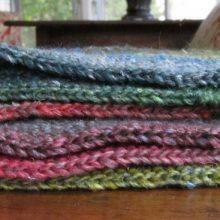 Hats off to our Team Blanket leaders: Sarah I., Karen, Sarah G., and Jennifer. You are the wind beneath our blankety wings! You’re the inspirationalest! You were probably really good at student council, too, back in the day. Thank you, thank you! 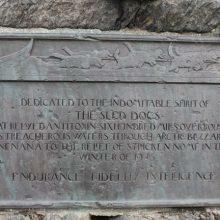 Endurance. Fidelity. Intelligence. Garter Stitch. It’s a great feeling to know that somewhere around 11 inches of my knitting is going toward wrapping someone in a little love, hope or warmth. 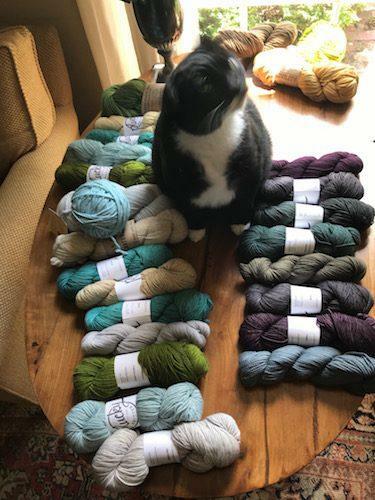 At my LYS, Four Purls, we are knitting mitered squares in Emma’s Yarn for one of our knitter’s who has just been diagnosed with brain cancer. “There’s power, power in Love” said Rev. Michael Curry. Knitting is love in a tangible form. You know what’s really great? To wake up on a vacation morning and not know what’s going to be on MDK today (because you’re on vacation) and it’s this and you get a little weepy there for a minute. I heart knitters SO MUCH. This is such an awesome idea!! Thank you! I signed up for a square – there was a little reminder to add a “photo” to my ID. I needed to locate one and now I can’t find the directions. Please help. I really can’t find enough of the right words to tell you how amazing this has been (which is a shock, I know, because I usually can’t stop talking.) Team Blanket 2 is coming together in ways that I never imagined. 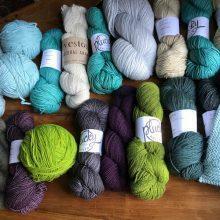 We have a great group of knitters all over the country rocking this out. It’s funny, when I first sent you the email that I would lead a time, as soon as I clicked send, I thought I had lost my mind. We’re all busy people with other things to do and other priorities and commitments. Somehow though, time has suddenly opened up and made room for this. Nothing else changed–it’s not like I’m on vacation or anything like that. It’s just the space was suddenly there. Thank you so much for inspiring and getting us all together here in the first place. It’s a pleasure and an honor to be part of this community. Karen I’m so glad that you’re leading the team! I am very happy to participate with you. I love how your idea for the recipients was so Crystal Clear. I am not surprised, though, I know you for a while now and I know you have one of the biggest hearts on the planet coupled with the best sense of humor. Thank you for taking the lead. 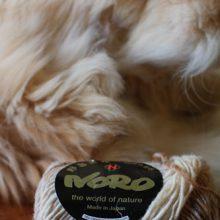 I got my yarn at Flying Fingers last Sunday and I’m looking forward to starting my knitting this weekend. I’m part of a group that does our knitting with looks. 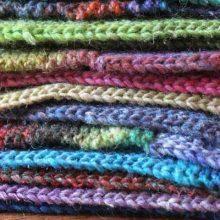 We do hats for cancer patients and preemies, getting ready to start scarve projects for Special Olympics. Is there somewhere in your group we could fit in? Is there any way you can have a Team that creates basic squares? I’m afraid the miltered pattern is beyond my current capabilities. Thanks! I might have to learn!! No dpns required! . Just mitered squares and log cabin—if you can do a decrease, you got this. Of course there’s room for you! The upside (and downside) of Team Blanket 2 is that it was a big fire and we can always find someone else for a blanket. I’ll set up a thread called Team Blanket 2.1 where those of us who are new or inexperienced can play along. Hey! Maybe we’ll all learn something new. By the way, I think your comment was very courageous. We can all learn from each other. I’ll make sure that Team Blanket 2.1 has lots of good resources and tutorials. I purchased this pattern when it first came out, but knew I would never get around to knitting a whole blanket. So now I’m all set to knit a square for #MDKTeamBlanket2! Thanks for the update. the photos are super-inspiring !! I signed up to make a blanket square, but I can’t get into the Lounge. When I click on the tab, the screen is just blank. Any ideas? I made one of those blankets. The blanket was beautiful!!! Hiding the ends took more time than knitting the blanket! (Or at least it seemed like that.) But it was definitely worth it. I can only crochet is there a pattern for that?